Politeness is pure form. Our children don’t understand why they have to behave in a certain way. But the more they do it, the more they come to understand Gentleness, Humility, Compassion and other great virtues. Content follows form. May I suggest that form helps to create content? The imitation of virtue over time becomes the real thing. 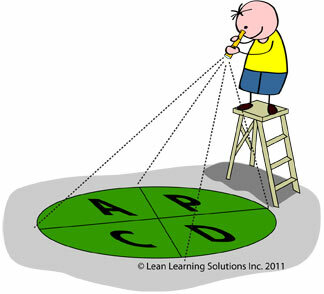 What’s this got to do with Lean management? Quite a bit. What’s the best way to change one’s behavior? Why, through a set of routines – even if you don’t fully understand why you’re doing them. In our old Toyota plant, I often didn’t understand why we did certain things – daily stand-up meetings, scheduled & purposeful gemba walks, PDCA cycles around all significant activities and the like. But I did all these things because that’s what you did in a Toyota factory, and because I intuited a deeper, richer pattern, a chessboard grander than any I’d imagine before. By walking I found out where I was going.